With Deadpool being released this weekend, and because I just heard Stan Lee will be at Denver Comic Con, I wanted to do a whole week dedicated to one of my favorite things: super heroes. From comics, to toys, to the big screen this week The Unheard is all about clobbering time! So up, up, and away! This was the first comic I ever owned. When I was younger, I participated in a Young Writers’ Conference. I don’t remember too much about it, I don’t even recall what I wrote. But I continued to take creative writing classes throughout school, even in college. You would never know it from what I have published here, but I actually enjoy writing fiction. I just started to get back into it. This interest in story was fostered by the stories found in comics, often stretching across several issues. Then in the fourth grade, I and three friends started a comic book company. It didn’t take long for us to break off in two groups in order to have rival companies. I’m almost certain none of us actually made a single comic. It seemed our only goal was to create the largest stable of new and creative heroes and villains. My signature character was this skeleton guy with a giant sword. I can’t remember what I called him but I’m sure it was something super clever like Skull Guy or Bone Man. All I knew was I could draw a pretty good skull and sword. The rest was okay, I’m pretty sure he lacked pelvic bones and had the wrong number of ribs, but I was never good with life sciences. While the drawing didn’t really pan out for me, I still do some light sketching and doodling to help with stress and get my mind straight. And I often draw things of the super hero or cartoony nature. And still quite a few swords. On the artistic and creative side, comic books and super heroes obviously had a huge impact on me, and almost immediately. But what I have come to learn about myself and comics, is they have a deeper influence on me than I initially thought. This picture used to serve as my desktop wallpaper on a computer at work. This was a computer screen many people would see as they passed me multiple times a day. 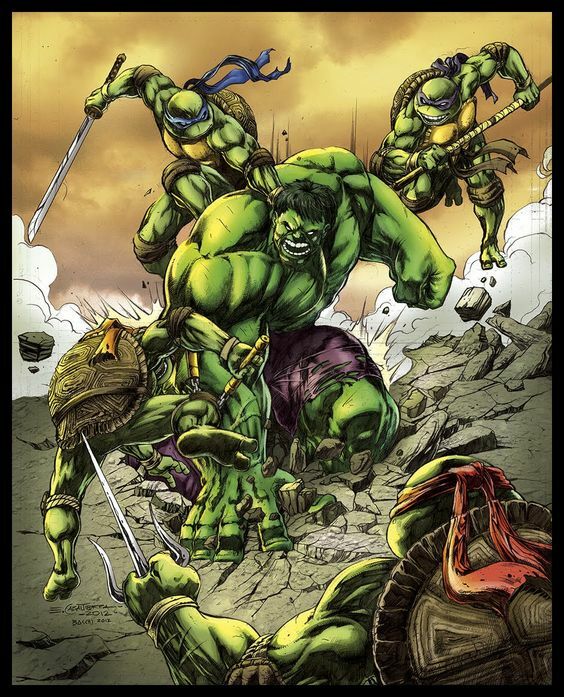 If you didn’t click on the link, it’s a rendition of the Teenage Mutant Ninja Turtles engaged in battle with the Incredible Hulk. As people would notice what it was I would often have a conversation as to why the Turtles, good guys, were fighting the Hulk, another good guy. After the umpteenth time of explaining that the Hulk would often go on rampages out of his control and attack the city, and the Turtles were only trying to protect the city and those living in the city, I realized I had a better grasp of the grey areas that exist in the world. Almost everyone is brought up with clear-cut stories of good versus evil. Most comics generally follow this notion. But they also tend to veer and toe that line, or straight up question what we perceive as good or evil. Not every seemingly good person is good all of the time. And sometimes an evil guy can have moments of goodness. I think comics taught me not to put people in such exclusive boxes. Then there’s the aspect that makes people with super powers the most interesting: how the powers affect them. I always hated Superman because it was boring to see a guy who would win all the time. But also it wasn’t interesting to see the way they had this alien adapt to life on another planet. But with my personal favorite hero, Spider-Man, we got to see how a teenager adapts to suddenly having new and unique abilities while also trying to maintain a normal teenage life. This extends as he ages and he has to juggle super hero life, work life, and social life. It’s suddenly more complex. I’ve always been fascinated with why people do the things they do, the choices they make. The good comics always explore this area as well. Comics have taught me much about the human condition and human motivation. They have increased my love for art and writing. They have given me countless hours of entertainment. But to fully explain why I love comics and why I find them important we have to turn to the famous Spider-Man line, “With great power comes great responsibility.” We are all given gifts in this life and it is crucial we use them in the best possible way. I know what my gift is and I’m doing my best to do my best with it. I hope you can do the same.